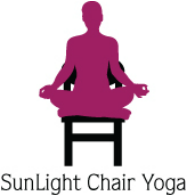 Retreats - SunLight Chair Yoga: yoga for everyone! Bring a customized Yoga and/or Chair Yoga retreat to your corporate event or retreat weekend. A yoga retreat to learn Stress Reduction techniques, Yoga, Gentle Yoga and Chair Yoga is a great way to restore the body and mind with yogic exercise, relaxation, meditation and healthy eating. This isa wonderful team building activity as well for company retreats. Sessions can range from 1 hour to a full weekend of yoga and stress management classes. Yoga truly is for everyone. This includes specific yoga postures modified using a chair (standing and seated), breathing to calm the mind and bringing healing and energy to the body. Customized yoga courses for your business or personal retreat weekend welcomes those new to yoga, or experience practitioners wanting gentle yoga classes. All ages and stages of health are welcome. This is useful for those with limited mobility, seniors, those with chronic illness, if healing from an injury, pre/post surgery and for those wanting to learn how to do yoga at work, in a chair to reduce computer related neck, back, shoulder and eye strain or just wanting a gentle yoga class. Contact info@sunlightyoga.com for more info. or on the form below.